(L-R) Naheed N.,Fiona H-F, Mary Macleod, Sally S., Heidi R. and Helen R.
More than fifty local women demonstrated interest in enterprise by attending a seminar last week organised by local MP Mary Macleod. 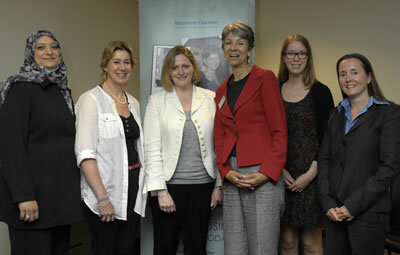 Hosted by Barclays, the event welcomed women of all ages and backgrounds to find out more about starting-up a business. Speakers from Start-Up Britain, The Prince’s Trust and Barclays addressed the busy conference room on the advice, finance and support available to women looking to set up a business. Successful local entrepreneur, Fiona Hamilton was also present to provide first-hand advice about the challenges and rewards of embarking on a business venture. The session marks the launch of Mary’s project ‘Entrepreneurial Women: Taking the Start-Up Challenge’ which aims to highlight the valuable contribution women could make to the economy by starting a business. The speakers included Fiona Hamilton-Fairley, founder of Kids Cookery School; Heidi Richards of The Prince's Trust; Sally Smith, Hounslow Chambers of Commerce; Helen Roberts, local representative of Start-Up Britain, and Naheed Niazi, of Barclays Bank. Mary Macleod commented: “I was very impressed to see that we have such a high number of enterprising residents from a variety of backgrounds. I know from feedback that the valuable advice on offer has spurred on several women to take their business ideas to the next level. Even such a simple thing as highlighting the number of resources available to women has been hugely helpful. Entrepreneurial Women: Taking the Start-Up Challenge was held at Barclays, Hounslow High St on Friday 15th June from 08:30-10:00 and attended by over 50 local women.